CST secures dominant IP position for EML4-ALK in NSCLC that spans from research through diagnosis and therapy. 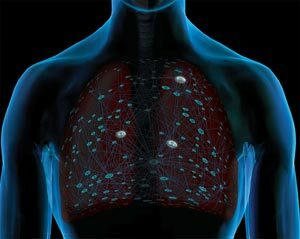 Danvers, MA – July 9, 2013 – Cell Signaling Technology, Inc. (CST) announced today the issuance of a key US patent, 8,481,279, which relates to methods for inhibiting the progression of lung cancers that express the EML4-ALK fusion gene. The ALK fusion gene is an alteration or defect in a normal gene called anaplastic lymphoma kinase (ALK) that is thought to play a critical role in the growth of some non-small cell lung cancers (NSCLCs) and has been central to the development of several promising new, targeted cancer therapeutics. CST has previously been issued patents covering methods for detecting the EML4-ALK fusion, which has been reported in a subset of patients with breast, colon and non-small cell lung cancer (NSCLC). CST now has a dominant IP position for EML4-ALK in NSCLC that spans from research through diagnosis and therapy. CST was one of two groups that independently discovered that rare lung adenocarcinomas contain rearrangements of the ALK gene that result in the pathologic expression of a fusion protein, most commonly EML4-ALK. CST is unique in the industry as its research agenda is completely self-funded. Privately held and scientist led, CST leverages what is commonly regarded as the highest quality antibody portfolio commercially available, a byproduct of the company’s research to further its disease research agenda. The company regularly shares the results of its findings with the research community via high-impact journal publications (Cell, Nature Biotechnology et al.) and its ongoing, deep collaborations with academia and industry. CST is proud to be part of “one of the most elegant examples of translational research and personalized medicine that I have seen: a discovery going from a patient to the lab and back to patients, all within the space of two years,” according to Mary Pinder-Schenck, M.D., in an article about the ALK story in Cancer GRACE. Lung cancer is the world’s leading cause of cancer death, with more than 1.8 million new cases diagnosed each year, 85% being NSCLC. Approximately 3-5% of NSCLC patients have tumors positive for the ALK fusion gene. Patients are usually diagnosed with advanced disease and have a very low survival rate. Recently Pfizer’s Xalkori® (crizotinib) was approved in the US for treatment that targets patients with the ALK fusion and several companies have additional therapeutics in various clinical trial stages. Founded by research scientists in 1999, Cell Signaling Technology (CST) is a private, family-owned company with over 400 employees worldwide. Active in the field of applied systems biology research, particularly as it relates to cancer, CST understands the importance of using antibodies with high levels of specificity and lot-to-lot consistency. It’s why we produce all of our antibodies in house, and perform painstaking validations for multiple applications. And the same CST scientists who produce our antibodies also provide technical support for customers, helping them design experiments, troubleshoot, and achieve reliable results. We do this because that’s what we’d want if we were in the lab. Because, actually, we are.